Paul Thomson cut his teeth in the IT industry back in 1988 while still at university in Western Australia, started his own successful IT business helping out fellow students on campus. He sold his first laptop (a Toshiba T1100) – one of the first mass marketed laptops ever, in that same year! Paul proceeded to get a job at the Curtin University’s computing center – working on projects for the Wool technology unit in 1990. In 1991 Paul returned to run the family farm – where he continued on with his computing business – including wireless and Satellite internet installations, IT consultant for several small businesses and farms in the district. Over several years he gained experience in consulting with clients in advising, training and installing computer systems, whether it be for individual (farmer/home user) or for small businesses (local IGA, Machinery dealership, Tyre distributor, local Telecentres, Spraying contractors etc). He also returned to Curtin’s Muresk Campus, teaching Farm Management 101 (Introduction into computing) for one semester – while his mentor “Bert” was having a hiatus (at UWA of all places). In 2008 a lifestyle choice was made and Paul and his family moved over to South East Queensland – where he sought an early retirement from farming. 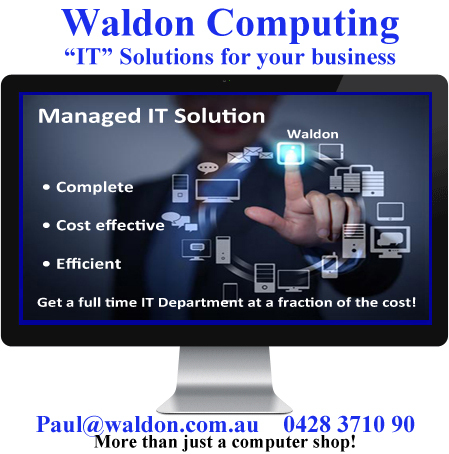 Within 12 months Paul had gained employment for a small IT business in Redbank Plains and after eight months decided to start his own business in IT – Waldon Computing. Paul has made the focus of his business in providing total IT SOLUTIONS for small businesses – drawing on his experiences not only as a IT consultant but as a small business owner himself. Paul makes a conscious effort to listen and understand his clients, their business and most importantly their goals and objectives. Once forming an understanding and creating a relationship with his clients, Paul creates a whole IT solution that the client is comfortable with. Paul is never seen without his trusty mobile phone, and is always happy to talk with his clients, virtually contactable from ~ 0630 to 2230. The name “Waldon” originates from Paul’s father George “Bill” William Thomson – who named his farm after his two brothers Walter and Donald. Bill spent all his life on the farm and was one of the original founding members of the W.A. Simmental Society – producing one of the first pure bred Simmental Calves in W.A. Circa 1979/80. We provide the SOLUTION not just GREAT SERVICE!